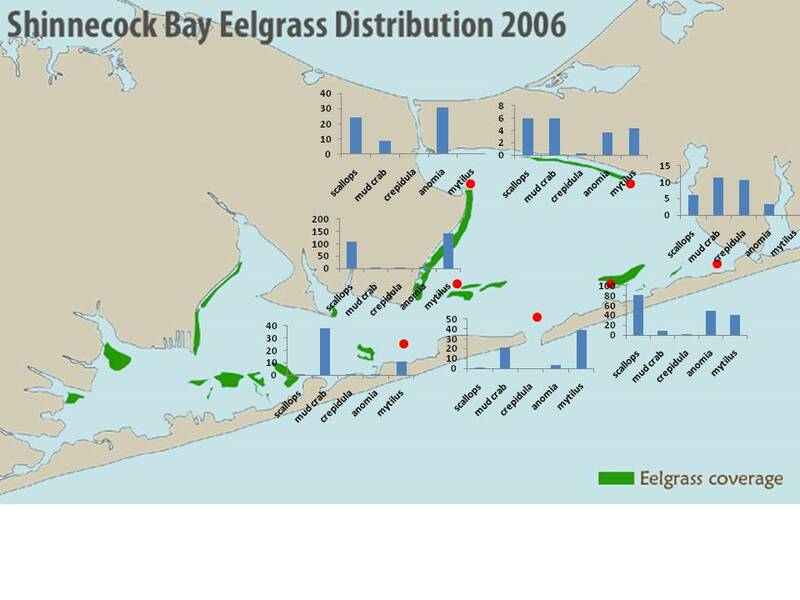 Although there are a lot of them associating with eelgrass beds in Shinnecock Bay, NY. Nope, I am hunting for baby scallops. 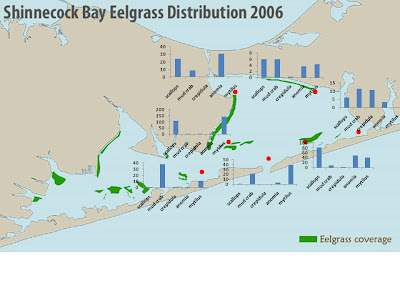 Shinnecock Bay has some of the healthiest eelgrass meadows in Long Island, and in some places within the bay, new meadows are forming. This is great, as many species depend on seagrasses as predation refuges and nursery grounds, including my model organism, bay scallops. Why then are there apparently no scallops in Shinnecock Bay? Well, its not exactly that there aren't any, of course, but that there are so few, they might essentially be ecologically extinct. However, restoration efforts in the Peconics and larval monitoring have turned up some pretty exciting results. And, Shinnecock Bay is connected to the Peconics through a canal, whose gates are left open when there is a high tide in the Peconics, allowing water to flow into Shinnecock Bay. This is a potential source of scallop larvae. While the spawner sanctuaries are quite distant from the canal, there is a growing scallop population around Robin's Island in Great Peconic, not far from the canal. And either way, scallop larvae spend up to 2 weeks in the water column, so it is possible for fairly long distance dispersal. So I thought we might see some scallops in Shinnecock Bay. I certainly saw some juveniles last summer, but didn't see any adults, so their survival is likely very low. One reason is probably predation. 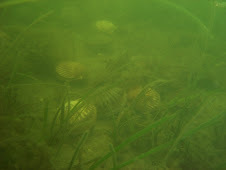 The same eelgrass meadows that are valuable for scallops is also a valuable habitat for blue crabs and mud crabs, both of which eat scallops like popcorn (or at least I imagine that's how they eat them). And yet, no one has investigate either scallop or blue crab recruitment in Shinnecock Bay, so that's what I am currently doing. My scallop monitoring has already started, and surprisingly (or maybe not surprisingly), I didn't get the results I was anticipating. Instead of the highest numbers of scallops at the site closest to the canal and diminishing numbers with distance, I had two relatively high spat numbers sites, on either side of the Shinnecock Inlet, opening up to the ocean. Could this mean a possible oceanic transport of scallop larvae into Shinnecock Bay? Is this supply-side ecology? There are clearly not large numbers of larvae, but there is a supply, and it's coming from somewhere, but to be honest, I have no idea where. 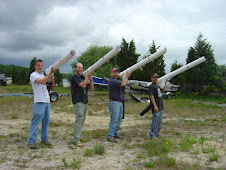 Soon I plan on sampling for blue crabs, whose larval origin I know is oceanic. If they display a similar settlement pattern, perhaps my question will be answered. On a side note, we did collect a lot of other organisms. All together, over 20 different species of organisms came up on the collectors. 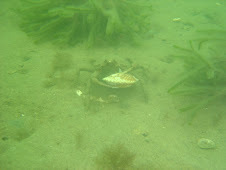 The most abundant were scallops, mud crabs, blue mussels, jingle shells and slipper shells. But we also saw 2 types of sea squirts, bryozoans, rock crabs, 4 different species of snails, sea stars, urchins, other bivalves (arcs, angel wings and cockles), scaled worms and other polychaetes. Oh yeah, and a few of these things that I have as yet been unable to identify, although my guess is some sort of nudibranch. So yeah, exciting stuff indeed.